The ends of the three bones in the knee – the femur, tibia, and patella – are covered with cartilage (a smooth material that covers bone ends of a joint to cushion the bone and allow the joint to move easily without pain) that acts as a shock absorber. 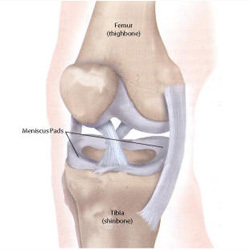 Between the bones of the knees are two crescent-shaped discs of connective tissue, called menisci, which also act as shock absorbers to cushion the lower part of the leg from the weight of the rest of the body. Magnetic Resonance Imaging (MRI) – a diagnostic procedure that uses a combination of large magnets, radio frequencies, and a computer to produce detailed images of organs and structures within the body; can often determine damage or disease in a surrounding ligament or muscle. Arthroscopy – a minimally-invasive diagnostic and treatment procedure used for conditions of a joint. This procedure uses a small, lighted, optic tube (arthroscope) which is inserted into the joint through a small incision in the joint. Images of the inside of the joint are projected onto a screen; used to evaluate any degenerative and/or arthritic changes in the joint; to detect bone diseases and tumors; to determine the cause of bone pain and inflammation. Radionuclide Bone Scan – a nuclear imaging technique that uses a very small amount of radioactive material, which is injected into the patient's bloodstream to be detected by a scanner. This test shows blood flow to the bone and cell activity within the bone.